Setup Area: 20ft wide x 30ft long x 22ft tall. 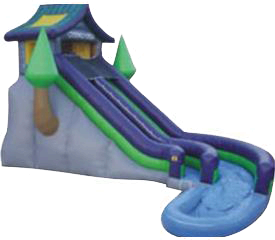 This Crooked Creek Water slide is perfect for that forest type setting. A cute little cabin atop the 22 ft tall slide to keep you out of the sun while waiting to slide. Front load climbing to slide then away you go...Recommend 3 kids at a time, one sliding, one climbing and one entering. This unit must be staked or tied off for safety, otherwise water barrels must be ordered.